The exhibition will be opening on Saturday, January 21st at 2pm till Saturday, April 29th at Blackburn Museum and Art Gallery. The exhibition is FREE. The Museum and Art Gallery is open Wednesdays – Saturdays from 12 – 4.45pm. Julia used the museum’s Columbian Press to create hand pulled prints in response to the Hart Collection. In 1946 Robert Edward Hart, left his large collection of manuscripts, books and coins to the people of Blackburn. Known as the Hart Collection, it includes Psalters and Books of Hours and also some of the earliest printed books by William Caxton. Julia has responded with to the collections various graphic elements with her own collection of relief prints which re-postion the imagary of the past into a more Contemporary setting, including Blackburn and the local environment. It is an eclectic response to an eclectic collection populated by fabled characters and beasts both real and mythical. The exhibition also explores the use of old and new technologies, while making the most of what the Columbian Press has to offer. A handmade book is created using traditional printmaking methods such as handcut woodblock and lino. 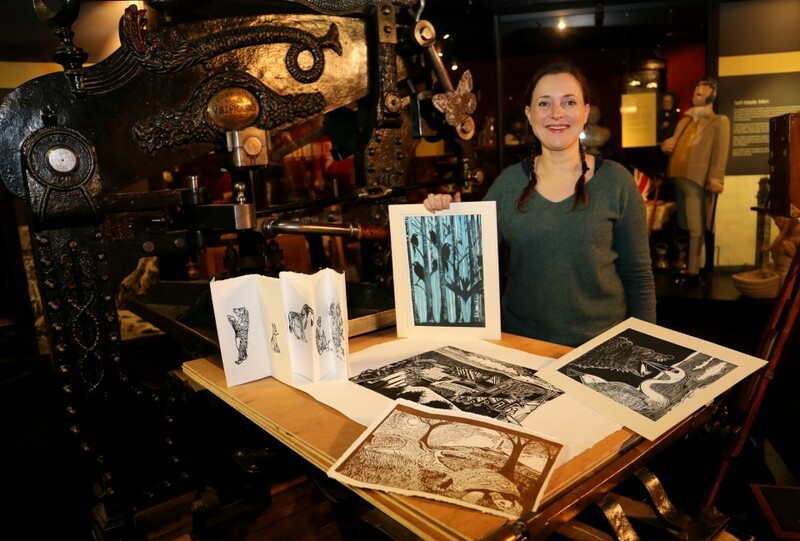 Working with the Making Rooms provides an opportunity to use new technology to re-create old woodcuts like those used in some of the earliest printed works of Chaucer. These blocks are then printed on the Columbian Press. The 15th Century meets the 19th meets the 21st. 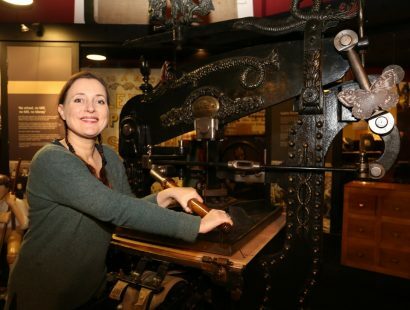 During her time at the museum Julia has introduced many visitors to the magic of the Columbian Press through demos and workshops. This includes delivering workshops to a diverse range of groups from Friends of the Musuem to school parties, local artists and Blackburns Youth Zone. Some of the work produced in the workshops will also be on show in the Museums Skill and Labour Gallery from the 21st of January.